Merge Farm! has a unique concept. It lets you combine crops to grow your farm. All you need to do is plant two seeds of the same crop, let them grow and merge them to produce more fruits/vegetables. Once you have gathered enough farm produce, you can sell them to customers to get coins. As you keep merging and selling fruits and veggies to people, you will unlock more seeds. Your customers will also demand a variety of farm produce, so you will have to plant several seeds and expand your farm to meet the growing demand for farm-fresh fruits and vegetables. Place two tomato plants on the grid by tapping the tomato seed twice. One plant generates one tomato in 10 seconds. You will have to wait for a few seconds before they grow. When ready, combine them to produce level-2 tomato plant. The level-2 plant will produce two tomatoes but the time required to produce one tomato will be lesser (only 8 seconds) than a level-1 plant. Note that the merged plant occupies only one tile, thereby freeing space for other crops. Repeat the above procedure to create another level-2 plant. Now you will have two level-2 plants. Combine them by dragging one plant onto another. This will create a level-3 plant that will generate tomatoes much faster than a level-2 plant. Do remember that two plants/crops have to be of the same level and of the same type. So a single tomato plant can’t be combined with a level-2 plant or a level-2 plant cannot be merged with a level-3 plant. Now that you know how merging works, you should now aim to create higher-level plants if you want to produce fruits and veggies faster. You can then sell them to customers and earn money quickly. Your goal is to create higher-level plants. Start with tomato plants as lots of tomatoes will be quite in demand. Create two level-3 plants and combine them to create a level-4 plant called “Rich Tomato Bush”. It will produce 5 tomatoes and the time to produce one tomato will only be 4 seconds. On the other hand, a level-3 plant will produce one tomato in six seconds. Now that’s a reduction of two seconds! Aim to create higher-level plants. You can create a level-4 tomato plant and then create another level-4 tomato plant. Combine them to create a level-5 plant. Called “Bountiful Tomato Bush”, it produces a total of 8 tomatoes and one tomato is produced in every 2 seconds. In Merge Farm, you will have to supply fruits and vegetables to customers. You can see what a customer wants by tapping his or her icon at the top of the screen. 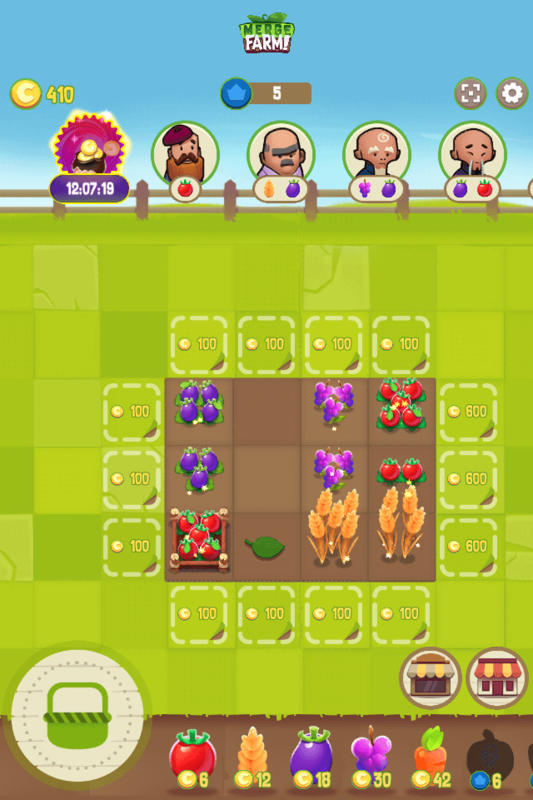 To supply farm produce, you will have to gather them using the green basket located at the lower-left corner of the screen. Drag the basket over a crop, when glitter appears over it. Sparkles indicate that the crop is now harvestable and the player can collect produce. Tap “Storage” to see all farm produce you have collected so far. You can access Storage by tapping the brown building icon at the lower-right corner of the screen. When you have fathered the required fruits/vegetables, a customer’s icon will glow. Just tap it to deliver products to him/her. Noticed the yellow fast-forward icon just underneath the green basket? Tapping it will allow you to double your harvests for five minutes. All you have to do is watch a short video to activate this boost. Tap the “Watch” button and once the video is over, just drag the special basket over crops to double the quantity of farm produce you receive from each of them. So if a crop produces 8 tomatoes, dragging the basket over it will let you collect 16 tomatoes. Try to wait when max veggies/fruits are ready to be harvested and then use the boosted basket to double the quantity collected from each crop. When you plant a seed, it grows to a single crop (level-1 crop). 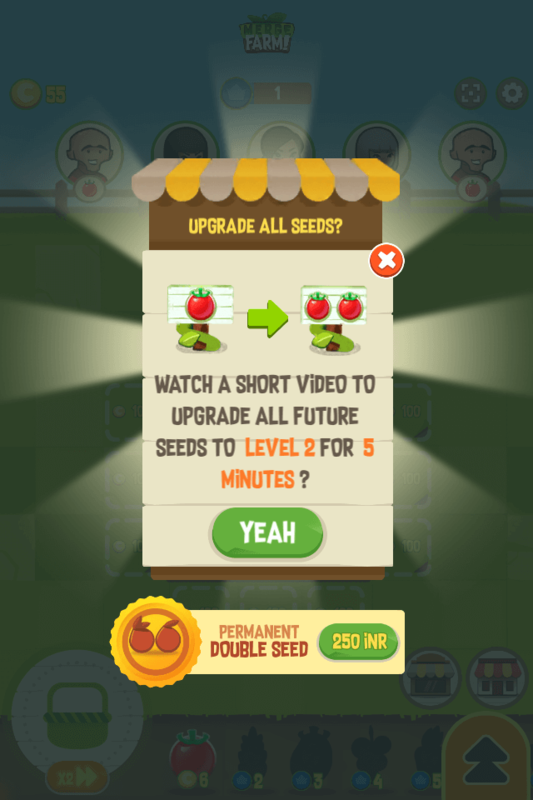 You can upgrade a seed to level-2 crop without merging by watching a short video. Just tap the black arrow icon located at the lower-right corner of the screen. Next, tap “Yeah” to watch a video. Make sure you are connected to the Internet before activating this upgrade boost. When the video finishes playing, all seeds planted on the grid will grow into level-2 crops instead of a single crop. When you see a leaf falling down, quickly tap to collect it. The leaf will be placed on the empty tile. Now keep looking for such falling leaves and tap another. You will now have two leaves. Combine both leaves to create a seed. You will then need two more leaves to create another seed. Now merge both seeds to create a random crop. Collecting leaves and merging them will let you grow a crop for free.